Betty Spiwe Katiyo of Zimbabwe delivers part of the Laity Address to an April 25 session of the 2012 United Methodist General Conference in Tampa, Fla. A UMNS photo by Paul Jeffrey. 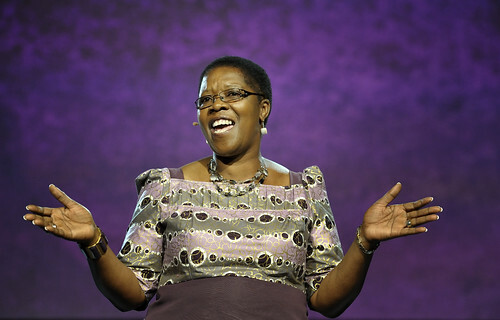 Inner City United Methodist Church in Harare, Zimbabwe, doesn't have enough seats for all of the worshippers who gather each Sunday, said Betty Spiwe Katiyo, the first person from Africa to speak in a Laity Address at The United Methodist Church's worldwide gathering. "People are so hungry to hear the word of God, they sit outside (the church) just for the opportunity to worship together," Katiyo said, noting that her church seats more than 1,000. Katiyo joined Dr. Steve Furr from Jackson, Ala., and Amory Peck from Bellingham, Wash., in delivering the April 25 Laity Address, which emphasized the mission to make disciples. All three speakers began with the words "by the grace of God, I am a disciple of Jesus Christ." Katiyo used the image of a symphony to illustrate the partnership between laity and clergy. "A conductor of an orchestra does not make a sound - instead enlivens others to be effective. Laity are the choir who should be making the noise, and clergy are the conductors. And guess what? To succeed, we need each other! "Somewhere in church history and tradition, the church began to endow certain rights, privileges and responsibilities of ministry to clergy. Clergy became the enlightened leadership, and laity became an audience, consumers of religion. That's not the way it was intended to be. &ellipsis; Making disciples of Jesus Christ is a responsibility of all Christians. We cannot be observers; we are called to be people of action." Katiyo challenged all delegates to "imagine if all laity brought just one person to Jesus Christ each year, the whole world would soon be transformed!" She also told them not to get "so caught up in legislative actions that you fail to re-adjust what is un-just." Peck talked about actions taken by 2008 General Conference in Fort Worth, Texas, that focused more responsibility on the laity for making disciples and transforming the world. The first action was adding "for the transformation of the world" to the end of the denomination's mission statement, "The mission of The United Methodist Church is to make disciples of Jesus Christ." "I'm proud of us for thinking audaciously," Peck said, "proud to be part of a church that names its mission in fearless, daring, bold and spirit-filled language. Proud that we - lay and clergy alike - overwhelmingly claimed such a vision." Another new addition was Paragraph 126 in the Book of Discipline, The Ministry of the Laity: "The witness of the laity &ellipsis; is the primary evangelistic ministry through which all people will come to know Christ and The United Methodist Church will fulfill its mission." "Laypeople, are you hearing what we've promised to do?" Peck asked. "Performing the primary evangelistic ministry by which The United Methodist Church will fulfill its mission." In a news conference after the Tuesday morning session of General Conference, Amory Peck added a surprise announcement about her role in the Laity Address. In commenting on fellow speaker Betty Spiwe Katiyo being the first central conference member to deliver the Laity Address, Peck, the Pacific Northwest Conference lay leader, said that she believed she was the first openly practicing lesbian to do the same. "I stood as a symbol of all LGBT (Lesbian, Gay, Bisexual and Transgender) United Methodists who are in our churches," said Peck, a retired librarian who is a member at Bellingham (Wash.) United Methodist Church and was the first-elected lay delegate from her conference. "Only a handful of people knew that, and I feel like I let a lot of people down in not saying it (in the address). I was sad that I could not say that openly. But the Laity Address is about bringing people together. Of course gays and lesbians are active in the church, but there is fearfulness in being open about it. I wish we could lift the silence because the silence is crushing. "I believe in what I said, that the church needs all of us, with no exceptions," she added. "I'd like to see all people welcomed at church, in membership and ordination." The final item that Peck mentioned was an addition to the church's membership vows. "Since General Conference met last, every new member has promised to be faithful to The United Methodist Church in his or her 'prayers, presence, gifts, service' - and the new vow, 'witness.' And each time our local churches have taken in new members, we have reaffirmed our vows, including our promise to witness. "So, laypeople, there it is, the beauty, reality and terrifying awesomeness of our role. ...The mandate covers each layperson here, and every layperson in our local churches. No exceptions no one excluded. &ellipsis;We commit ourselves to these new mandates. We, the laity, have taken, with new vigor, the great commission into our hands and hearts." Furr, a physician, discussed his physical transformation in losing weight as symbolic of the church. "As part of my personal transformation, a part of me had to die so that the rest of me could live," he said. "A part of me had to die so that the real me could live," he said. "Today, as we struggle to transform our lives and our churches, we must realize some things are going to have to die; some things are going to have to be left behind so that we can continue to live and thrive." Furr said he lost more than 60 pounds by transforming from unhealthy habits to healthy living: eating less food, eating more nutritious food and working out. He said the transformations of the first followers of Christ were even more dramatic. "(They had) lives so transformed, so different, that some of them even had to change their names; from Simon to Peter, Saul to Paul. They were such different people it was as if they had been born again." The United Methodist Church and this General Conference must be transformed, Furr said. "The gym is not a place for talking. It's an action place. It's a place of transformation where our bodies are changed from one form into another. Our churches must also be places of transformation. &ellipsis;Truly Jesus Christ is the best personal trainer ever!" *Caldwell is editor of the Virginia United Methodist Advocate and a member of the United Methodist News Service team at General Conference. News media contact: Maggie Hillery, Tampa, Fla.,(813) 574-4837 (until May 4); after May 4, (615) 742-5470 or newsdesk@umcom.org.